Your Callsign--How do you announce yourself? Re: Your Callsign--How do you announce yourself? An old thread, I know, but I'm interested to know if any of you have revised your call signs in the intervening five years now that light sports are a bit less obscure and the FAA has a new AC concerning call signs at non-towered airports. I've been using "Light Sport Nxxx" at towered airports and "Blue and White Low Wing" at non-towered fields, but am beginning IFR training in my Sling Light Sport and may as well get it right. Well when I first got my plane an experimental Zenith 601, I was taking lessons and my instructor used "red and white light sport". While studying for my written I discovered that if you have an experimental plane you are supposed to use that in your call sign. So I started using "red and white experimental" at our local airport. When we would go to a class D or C I would say "experimental 963MJ(phonetically of course)". Now a couple of times that I've used flight following they asked me for type of aircraft. The first time I said Zenith CH601(the ICAO code is actually CH60). That worked the first time but the second time they wanted more. So I just said "experimental light sport" and they seemed happy with that. So I guess I'll go with experimental light sport and see where it gets me when I have to use ATC. At our local, non-tower controlled airport, most people just use manufacturer (i.e. Cessna, Piper) and most of the time color although I find "yellow cub" a bit redundant. I just use Sting 184WA everywhere I go. Experimental Op limits state that you must use the word "Experimental" when talking to ATC. The op limits for S-LSAs state that you must use the words "Light Sport" when talking to ATC. I've never seen any benefit to adding my make/model, because no one knows what that is anyway. Where does it state that I have to identify my plane as light sport the way experimentals do ? Warmi wrote: Where does it state that I have to identify my plane as light sport the way experimentals do ? If your plane is registered in the S-LSA category, the operating limits assigned to that plane say so, if that op limit was assigned. 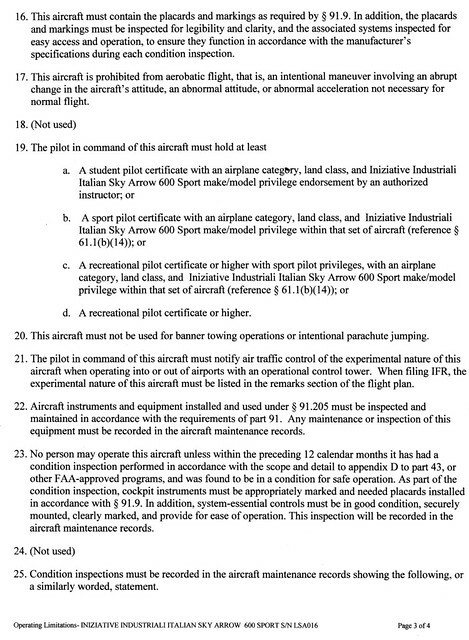 comperini wrote: Experimental Op limits state that you must use the word "Experimental" when talking to ATC. I believe that’s only on initial contact with each facility. Other than that, I call my E-LSA “Sky Arrow” followed by the call sign. FastEddieB wrote: I believe that’s only on initial contact with each facility. Also, I notice that the FAA has seriously revamped FAA Order 8130.2. Apparently, the latest version is 8130.2J. Unless I missed it, I don't see the similar op limit being required for S-LSAs any more. So, maybe that is no longer a requirement. Heck, I couldn't even find the same op limit for Experimentals any more. So, just control towers. Though it may come up elsewhere on the FAR’s. I just use “experimental”, but I could also use “experimental flight design” or “experimental CT”. On initial contact I say "Experimental Zodiac Nxxxxx" and on subsequent calls I just say "Zodiac Nxxxxx." I'll often get asked for my aircraft identifier and say "Charlie Hotel Six Zero" which is the ICAO identifier for the Zenith Zodiac models. More often than not ATC will then call me out to other traffic as a helicopter (Sikorsky makes several helicopter models like the Knighthawk and Blackhawk with the ICAO identifier H60). They also sometimes call me "Kodiak Nxxxxx." In both cases I have to correct them trying to inject some humor while doing it. Me: "Greenville Approach SkyCatcher N12345." Greenville Approach: "SkyCatcher N12345 Greenville Approach." Me: "SkyCatcher 345 is a C162 over Clemson at 5500 landing Downtown Greenville with Charlie." Greenville Approach: "SkyCatcher 345 squawk 1234." Me: No response. Just enter the squawk code. Greenville Approach: "SkyCatcher 345 radar contact 1nm east of Clemson airport, altimeter 30.04." I agree. Don't use light sport. That means it could be a 100 different types. Is he fast, slow, high wing, low wing, trike, ect... The controller needs to have some idea what he's looking for in the pattern. Things like Remos 525AB or Flight Design 525AB or Allegro 525AB or Sting 525AB are more telling and appropriate. Just because a controller hasn't caught up yet with what's going on doesn't mean we can't educate them. This also makes it easier to look up the type of aircraft in their books. I go with the best of both worlds with ATC. Initial contact is 'Light Sport Sting 595L' then I simply go with 'Sting 595l' or, more likely, just '95L' on further communications. I find this limits the back-n-forth chatter on 'what is a Sting' which I believe is a good thing in Class B airspace.